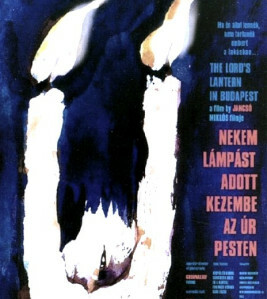 The first Miklós Jancsó film I ever saw was 1999’s The Lord’s Lantern in Budapest (Nekem lámpást adott kezembe az Úr Pesten). It was an odd introduction to this great filmmaker’s work. I’d heard a lot about the slow, meditative qualities of Jancsó’s (YAWN-cho) style – the elaborate, highly choreographed long takes, the immense stretches of silence, his austere mise-en-scène. What I saw that day in a university film theatre in Budapest, however, was lots of static camera, long stretches of meandering, but very talky (and often hilarious) dialogue, and a heightened sense of surrealism and absurdity conveyed via persistent impossible match cuts. It was not the introduction to the “master’s” work that I’d been expecting, and I remember feeling a bit put off. Like all great artists who live for a long time, Jancsó’s style changed over time. The filmmaker I’d wanted to see that day had long stopped working and moved on to other interests, other styles, other explorations – several times over, in fact. Some years later though, I returned to Jancsó and found what I had been looking for. His collection of films from the mid-1960s to the early 1970s marks one of the greatest contributions to world cinema of the past half-century. This may sound hyperbolic, but I don’t exaggerate. From at least The Round-Up (Szegénylegények 1965) through Electra, My Love (Szerelmem, Elektra 1974), Jancsó put together a body of work that remains as formally remarkable, as thematically complex, and as surprising in narrative as the great stretches of work by the likes of Antonioni, Tarkovsky, Truffaut, or any of the other eminent directors of European modernism. Like those filmmakers, Jancsó’s films offer a compelling marriage of style and narrative as they explore complex questions of politics, ethics, morality, and individuality and personal freedom. Along with many of his contemporaries, Jancsó attended the Academy of Theatre and Film Arts in Budapest. After graduating in 1950, he spent most of the next decade traveling around Hungary making newsreels and short documentaries (it was during this period that he met and married his second wife, the director Márta Mészáros). While these projects feature little in the way of technical or stylistic innovation, it was during this decade that Jancsó developed both a vast technical knowledge of filmmaking and a deep familiarity with the development of the Communist regime in Hungary and its effects on various parts of the country. While Jancsó made intermittent stabs at feature-film making between 1958-1963, it was with 1965’s The Round-Up that he first displayed the traits that his filmmaking would come to be admired for over the next decade. Like many of his films, The Round-Up is set in the past as a way to interrogate the present. In this case, the film is set entirely in a makeshift prison on the Great Hungarian Plain in the years following the 1848 anti-Hapsburg uprising. Men who were once considered “freedom fighters” for the cause of Hungarian independence are now rounded up as terrorist prisoners. The authorities use psychological and physical abuse, plus the constant threat of execution, to cow the prisoners into submission and, far worse, to coerce them into informing on their former friends and colleagues. Like many of the films that would follow, The Round-Up is a meditation on the ways that power can force people to turn against their own best interests. And like many of those films, its marriage of style and narrative deepen the film’s contemplation of the absurdities of war and authoritarianism. Speaking in 2008, Jancsó said of the film, “everybody knew that this was not a historical film, but that it was about the Hungarian history of the recent past. It was also about the 1956 revolution . . . we knew that very well, but the Hungarian audience also knew that.” With this in mind, The Round-Up’s opening depiction of a seemingly arbitrary execution can be read as an indictment of the mass imprisonments and executions that were meted out in the wake of 1956. With his 1960s films Jancsó experimented with ever more elaborately choreographed long takes, shot in stark black and white, with minimal dialogue. As the 1970s dawned, his style began to change. The Confrontation (Fényes szelek 1969) was his first film shot in colour, and with Red Psalm (Még kér a nép 1972) his films suddenly exploded with both dialogue and music. They also saw the increasing use of post-modernist and absurdist elements. While his ’60s films often commented on absurdity in life, with Red Psalm he began his long affinity for incorporating absurdity into his style. Characters break the fourth wall, singers appear on screen as both diegetic characters and extra-diegetic narrators. In many ways Red Psalm appears to be a wholly different film from those Jancsó was making in the 1960s. While it does share his penchant for the choreographed long take, it eschews many of his earlier stylistic trademarks. The ’60s films, whle highly formalized, were grounded in a visual and narrative realism that the later films would slough off in favour of an absurdism that is at once both warm and alienating. A testament to Jancsó’s mastery of both styles is that Derek Malcolm names The Round-Up not only as Jancsó’s best, but one of the 100 best films of all time, whereas Jonathan Rosenbaum considers Red Psalm his best, and one of the best ever Hungarian films (Red Psalm garnered Jancsó the Best Director award at Cannes in 1972, his one win in five nominations). While Jáncso continued to push himself stylistically and thematically, after the mid-1970s, his output became less consistent and he fell out of critical favour. His dabbling with surrealism developed into an almost impenetrable narrative style that make many of his films from the 1980s and early 1990s difficult viewing, and he also continued shooting documentaries. It was with 1999’s The Lord’s Lantern in Budapest that Jancsó made something of a return. A dark, cynically humorous look at post-Communist Budapest, the film follows two grave diggers, Kapa and Pepe, as they try to make sense of a new world in which there seems to be little or no connection between past and present (and in which, continuing his post-modernist streak, Jancsó not only appears as himself, but is vociferously criticized by the grave diggers as a has-been and dies. Twice!). The success of Lord’s Lantern would lead Jancsó to make several more films about Kapa and Pepe which have become cult favourites in Hungary. Jancsó’s influence amongst filmmakers has been immense, even as his reputation amongst film viewers outside his native Hungary has remained muted. The renowned Béla Tarr has called him the greatest Hungarian filmmaker and Tarr’s stylistic debt to Jancsó can hardly be overstated. He’s been praised by Martin Scorsese and Darren Aronofsky (whom Jancsó taught), and Alfonso Cuarón has discussed his deep admiration for Jancsó’s work. While his films can be difficult to find, many of them have been released in restored prints by UK-based Second Run DVD, often with insightful interviews and other extras. Miklós Jancsó died on 31 January of this year. He was 92 years old. Amidst the din of the Super Bowl and the shock of Philip Seymour Hoffman’s tragic death, and due in no small part to his diminished reputation and underappreciation, it may have been easy to miss his passing. However, there is no reason not to honour his memory – and do yourself a favour – by watching his films. This entry was posted in Previous work and tagged Hungarian film, Miklós Jancsó, obituary. Bookmark the permalink.